I’m Rob the Inventor and Founder of Illuminated Apparel. 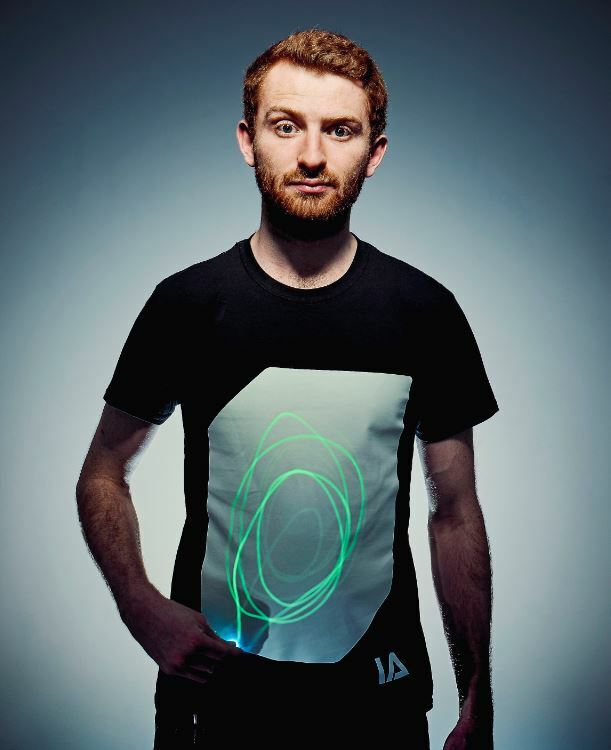 We create interactive glow in the dark clothing that can be drawn on with light - imagine an Etch a Sketch on your clothing - which is great fun for a festival or party. We are a growing start-up who have benefited from the Government Start Up Loans scheme supported by Virgin StartUp. As a maturing start up I was keen to listen to Philip Hammond deliver the Autumn Budget Speech to understand the impact on businesses like mine. Overall, I feel it was positive speech with some key points being made towards start-up businesses and no major unwanted surprises. However, with growth forecasts having been cut from 2% to 1.5% in 2017 it is imperative that start-ups are given some support to help us grow the economy and create new jobs. We export to a number of countries and we also purchase supplies within Europe. The single market has made it very easy for us to expand reducing the paperwork needed, allowing us free movement to attend trade shows easily, and finally eliminating taxes and tariffs so we can keep our prices competitive. So we are keeping a close eye on Brexit! There is a lot of uncertainty on how we will trade with Europe after leaving the European Union, I am of the opinion that until a final decision is made there is no point worrying about what will happen, our wholesale business to Europe has actually increased since the Brexit vote. We also have no problem trading with companies outside of Europe so I don’t think we will be affected heavily. This Budget gives me some more confidence that we are approaching a clearer plan on Brexit, which will give more clarity to my business and our European partners. VAT Threshold not lowered and to be kept at £85k for two years. This is great for those B2C start-ups and small businesses in service industries where reclaiming VAT on supplies is not as important as keeping down consumer prices and avoiding the extra paperwork. On the other hand if you are primarily in B2B and manufacturing your own product, like Illuminated Apparel, then it makes sense to register for VAT early on. Hammond stated that measuring Business Rates against CPI (Consumer Price Index) instead of RPI (Retail Price Index) will save businesses £2.3bn over the next five years. For those who don’t know, RPI and CPI are measurements of inflation that are calculated from a “Basket” which is based on a range of consumer goods and services to work out an average. The main difference with CPI is that it doesn’t include mortgage payments, rents, and council tax. CPI usually rises less than RPI so good news for businesses as the increase in Business rates will be less. This will benefit Illuminated Apparel, but although we sell mainly through online channels, I do feel that some extra Business Rate incentives could be offered to the High Street to help it compete in a rapidly changing world. It is great to see investment being put towards new innovations AI, 5G mobile networks and fibre broadband to grow the Tech industry even more. Likewise, great to see investment being made nationwide with Tech Nation which will offer regional hubs around the country. A further £540 million is to be invested into electric cars and charging points as we move ever closer to cleaner transport. As the Chancellor quotes: “A new tech business is founded in Britain every hour and I want that to be every half hour,” this can only be good news! The EIS scheme is great for attracting equity investment as a start-up, so more welcomed news when the Chancellor raised the investment allowance for investors from £1m to £2m, however, this is restricted to knowledge-intensive companies. Even though this won’t apply to everyone, the more access to private funding the better. I feel the increase in the National Minimum Wage from £7.50 to £7.83 is fair and there are good reasons behind it. As an employer, I will need to ensure that I have incorporated the extra cost within my budget. Illuminated Apparel manufactures our own product we will have to ensure that the extra labour cost is factored into the Cost of Goods Sold (COGS). As the wage increase is marginal we can probably absorb it this time without increasing our wholesale/retail pricing model. This is vital to keep start-ups within the UK, we are still uncertain on how Brexit will unfold so it is important to offer investment to innovative companies. This will ensure companies will stay within the UK and with tax credits on offer, more jobs will be created. The Chancellor has pledged 1.7bn to a Transforming Cities Fund to help build and improve transport infrastructure throughout the UK. I sometimes feel there is a perception that you must start your business in London to give you the best chance of succeeding, especially in Tech. This is far from the truth, I have met many Founders from all over the country with innovative businesses and I am sure Virgin StartUp can vouch for this too. The government is now doing their bit to invest in the North (Northern Power House) and the Midlands which is going to help level the playing field for start-ups based all over the country. In general, I think the 2017 Autumn Budget has been beneficial to small businesses and start-ups. We should be quite happy with what has been said, lots of investment pledges towards innovative start-ups and the continuing support to the EIS scheme will attract more private investment. There has been no major changes that will make you have to revise your financial forecasts. I do think the investment is always favoured too much towards Tech start-ups, when there is plenty of opportunity to kickstart the High Street again. The points made above may not directly affect your business now however in the future they may become relevant. The government are doing a good job offering support through organizations like [others] Virgin StartUp is a part of and there are plenty of grants available. The DTI have helped us towards funding our tradeshows internationally, a costly expense for a start-up.